Beretta 92fs is a high quality air pistol made in Germany, this co2 version is 1:1 weight compared to a fully loaded 9mm version. Features a full metal chassis, comes with 2 .177 pellet magazines and a hard pistol case. Ex Demo in as new immaculate condition with original box tags and manual. Still has 12 month warranty. The Walther CP99 is high quality air pistol made in Germany. Comes with 2 .177 pellet magazines in a hard pistol case. The Webley Alecto, is a fantastic multi stroke pneumatic air pistol with differing power levels through more or less compression. The legendary Webley Mark 6 service revolver, in a very nice stainless exhibition finish. This pistol is in immaculate condition a very good example. Comes with 6 months warranty. Uses standard 12g Co2 cylinders. Comes cased with two magazines and a single shot tray+ Handbook. 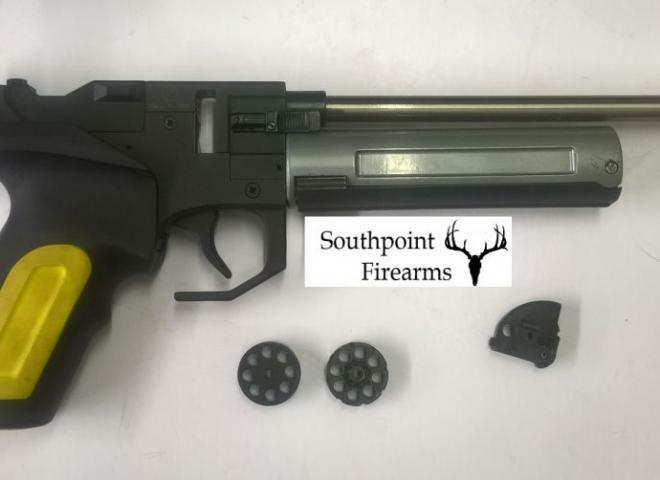 Dan Wesson pellet firing revolver with black finish and 8 " barrel. Dan Wesson Pistol silver Grey Steel 6"
New Beretta 92 in Chrome. Still one of our best selling CO2 pistols.With chrome finish. Comes in ABS box with 2 magazines.